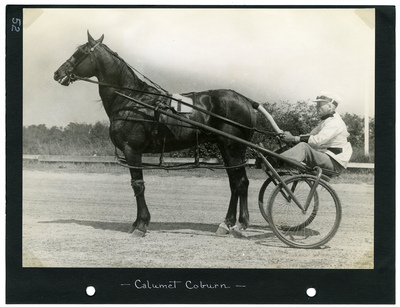 Sepia tone photograph of bay stallion, pacer Calumet Coburn wearing saddle number one, J. Grant up for the 2.10 Class Pace Div. A, on Wednesday, July 10, 1940 at the Kite Track in Old Orchard Beach, Maine.